This entry was posted on May 23, 2011 at 11:32 am and is filed under Aomori-city, Goshogawara-city, Hachinohe-city, Hirosaki-city, Mutsu-city, Shichinohe-town, Towada-city with tags JR East Pass, JR East Pass Special, shinkansen. You can follow any responses to this entry through the RSS 2.0 feed. Both comments and pings are currently closed. In any case, my goal is to come up (perhaps with some friends!) on the evening of the 17th, after work, perhaps from Koriyama city! Do you think this is possible? I know it sounds crazy, but… I really love uni! Thanks so much!! I wouldn’t mind trading e-mails, too! Hello Xan-san. Thank you for reading our blog and thinking about coming to Aomori! First of all I’m so sorry for the serious effect on seafood in Fukushima by the high levels of radiation. I hope you already know that you have to transfer Shinkansen if you come from Koriyama. You could get to Sai if you really want to. The problem is how to get back to Aomori. The final ship from Sai to Aomori is 12:35pm, so literally you can stay only for 35 minutes if you want to make a day trip to Sai. Staying in Sai is not really recommended. The area is not developed for tourism and you can find nothing but peaceful local country residensial area. If you still want to make it, please let me know and I’ll give you more detailed info. If just eating delicious uni can make you happy, Aomori-City can offer you fresh and reasonable “uni don(uni rice bowl)” in the restaurants in a seafood market. If you are interested let me know. 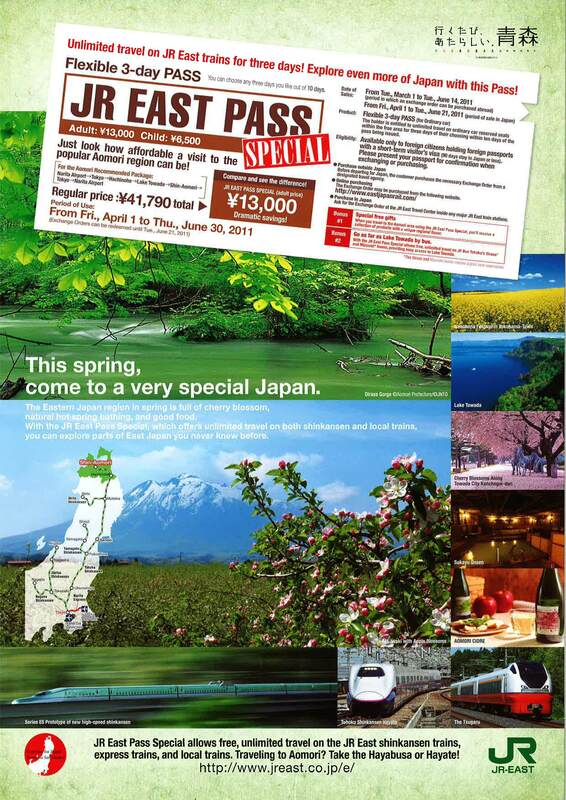 FYI this pass should be the cheapest to get on Tohoku Shinkansen. I posted a follow-up comment, but I’m not sure it went through. Would it be okay to stay at one of the minshuku or the like in Sai? I found a few listed on the Sai tourism webpage! Is there anything I should book ahead for? Thanks a ton again! from “Arusasu” are Kawabata Ryokan (5 min walk) and Minshuku Miyano(10-15 minu walk). Both would be more reasonable if you do not order meals. FYI there is only one convenience store open 7am-10pm near Arusasu and that would be the only place you can buy your breakfast. They would not speak English, but I assume you understand Japanese so it should be okay. Since the ship operation between Aomori and Sai are very limited, you would need to stay overnight both in Aomori and Sai if you leave Koriyama in the evening. As I said Sai is not the developed area for tourism, I still hope you would spend your time longer in Aomori, but what you put the higher priority on traveling is up to each person. So I hope you have a nice stay in Sai. Thank you so much, Yuko. Yeah, I’m little short of time, unfortunately… this is literally going to be a weekend trip for me! :O I’d like to return in the summer, too, so I bet this will help then too! I can buy tickets for the Polar Star on the ship, or at the dock? Gosh, I hope I can get one! Speaking of booking a room, I still don’t have something for Friday night in Aomori! I looked up some things, but is there anything you could suggest? I’m linking this post to my keitai, so hopefully I can reply at work, too! Also, I guess you won’t be working on Sunday? That’s the day I go home, and I’ll have some time! From 9:25 until 15:45-ish! I think I’ll explore the city a little! Thanks again so much for your help! 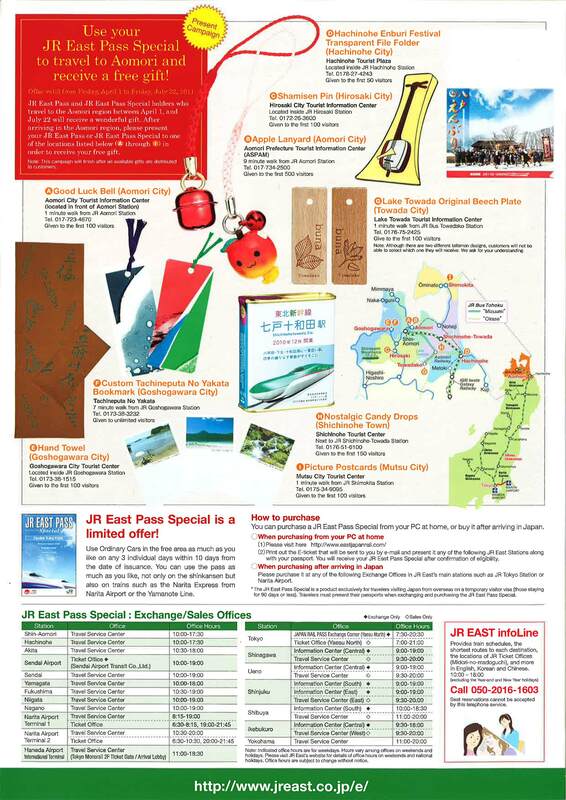 Tomorrow I’ll buy my one-day-in-advance tickets for the Tohoku area!